The major players in the market have implemented several strategies for example, & agreement, product launch, product development, and partnership business expansion. Among these, product launches held around 60% of the entire major strategies, whereas business expansion, partnerships, and product development collectively held around 40% of market strategies. The major market players for example, Honeywell Safety Products, Rahman Group, Oftenrich Holdings Co. Ltd., Saina Corporation Co. Ltd., COFRA Holding AG, Jal Group, UVEX Safety Group, ELTEN GmbH, and Rock Fall Ltd., and VF Corporation improve the product portfolios by bringing in industrial protective footwear with upgraded quality for various applications. For example, a well known firm, Rock Fall Ltd. in 2016, came up with Melanite, designed for the facility management, uniform services, and security & patrol services. The global industrial protective footwear market is foreseen to expand at a steady CAGR of 4.1% from 2018 to 2027. 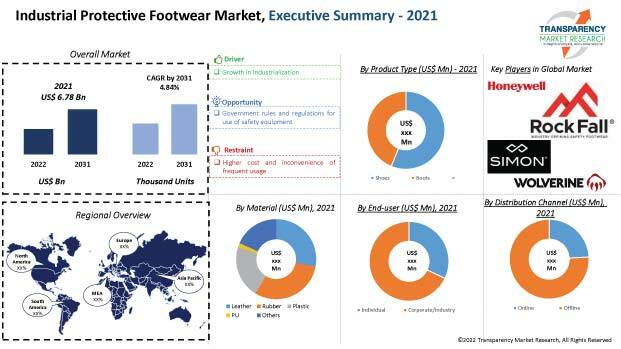 By the end of 2027, the global industrial protective footwear market is foreseen to reach around worth US$ 9,270.1 Mn. On the basis of volume, the market is prognosticated to expand at a CAGR of 5.5% within the forecast period from 2018 to 2027. The market is estimated to flourish with 163,013 ‘000 units by the end of 2027. Although leather footwear segment accounted for the highest market share in 2015, plastic footwear segment is expected to witness the fastest growth rate during the forecast period. This is attributed to their resistance against low temperature, crack, UV radiation, and waterproof nature. North America is a significant personal protection equipment (PPE) market in the world. Industrial protective footwear or safety footwear is part of PPE. Quick advancement in different businesses has expanded workforce globally. But, factory workers face poor working conditions, expanded work hours, and employment instability. This highly affects the development of the market. Stringent government directions with respect to work environment security have brought about surged demand of industrial protective footwear. Developing security requirements for labors in manufacturing and development parts should drive the size of industrial wellbeing footwear market. These industrial protective footwear give insurance against different dangers including moving machines, introduction to chemicals, falling items, and electrical contact. These shoes are fabricated in consistence with safety footwear models incorporating ANSI in the U.S. which may propelled the business development. Surged awareness towards security and health and labors alongside developing industrial fatality in chemicals, manufacturing parts and other development sectors inferable from absence of protection may propel the industrial healthcare footwear market development. These are intended to deflect and ensure slip resistance, foot fatigue, and give expanded help to the curve and impact point which are being fused in the footwear market, in this way stimulating the industry development.